Oh Colin! How I do love you! I am a big fan of pets with really-meant-to-be-a-person names. I think Herman the goldfish or Barry the dog would be winners! Imagine standing on your doorstep, shaking a box of cat treats and shouting “Colin…. Coooooooliiiiiiin. Come home to me, Colin!” Genius! Colin has a very special place in our hearts as it was created by our pal Leigh Hodgkinson who lives up t’road in the gorgeous town of Lewes. I have sung about my love for Lewes recently, with it’s scrummy bookshop and love for all things arty and beautiful. So when we heard Leigh was going to be selling her creations at the Lewes Art fair we were mittened and booted and on our way. I am particularly proud of my new-best-Christmas-decoration-ever, my ‘Share the love’ reindeer. She is very beautiful and has a special place in my heart. Mollie is, of course, very impressed with her pink rabbit brooch. Scrumminess! But do not fret my friends. You too can peruse Leigh’s wares and buy yourself something delicious. Have a peek at her site here. As well as our bought booty, Leigh gave Mollie a copy of Colin and the Snoozebox, one of the few books of Leigh’s that we didn’t already have tucked up at home. I’m happy to say that Colin has settled in well and is enjoying his new home in the Rhino Reading Rooms. As Mollie whispered into Leigh’s ear “I have two Colins now, Colin the cat and Colin my Grandad.” Destined! Colin the cat has a lot in common with Colin the Grandad. They both like a good old snooze and they both like a cosy place to sit. In Colin and the Snoozebox Colin the cat doesn’t have a comfy place to snooze. He doesn’t even have a home. Most of the time Colin is happy with his lot. But not when he is “terribly tired and grouchy and in desperate need of a big dozy catnap.” As luck would have it, Colin (the cat, not the Grandad) comes across a cardboard box and instantly makes it his home for a big snooze and his favourite dream. But, uh oh, the box is a real mover and a shaker and he ends up parcelled up and delivered to recipient after unhappy recipient. Nobody wants poor Colin and he is bounced back and forth, back and forth. All he wants is a comfy cushion and some quiet! Is that really Too Much To Ask?? Leigh has a very distinctive style full of contemporary humour and funky collages. We love Goldilocks and Just the One Bear, Limelight Larry and Troll Swap, but Colin will forever hold a special place in our hearts. The joy of this book is in Leigh’s use of language. She has an ear for the way children play with language and she creates the most fantastic sentences full of alliteration, silliness, and perfectly positioned characters, from teapot-collecting Lady Snootlethorpe, and Mister Marshmallow the polar bear – who is a fairly fussy eater, to the deliciously named Grandma Flapjack. Perfection. Colin is very happy snuggled up on our bookshelves and I’m sure he’d be just as at home on yours. 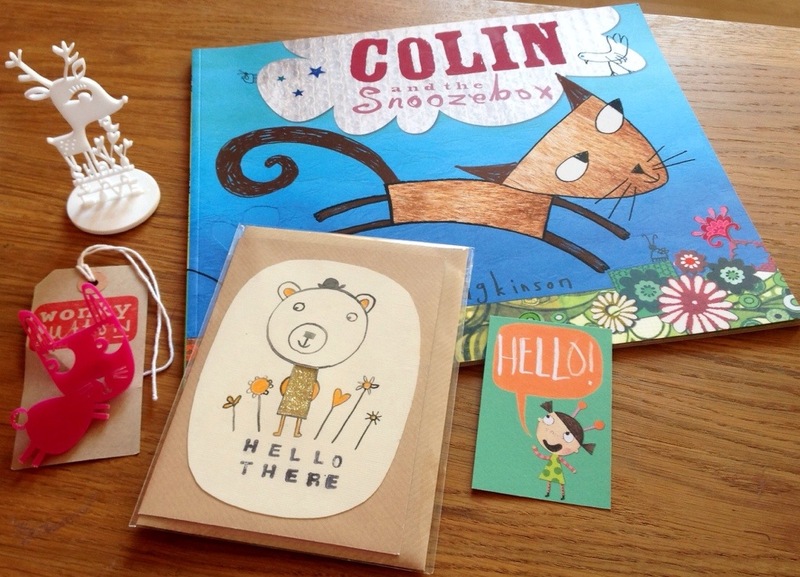 Source: Colin was a pressie for Mollie from Lovely Leigh. She didn’t ask me to write this review, we were too busy chatting about cake and books.